Courtesy of Alex Gray, Oceana. Last month, the California drift gillnet fishery for swordfish resumed without desperately needed protections for at-risk animals. These drift gillnets are indiscriminate killers of animals like sperm whales – swimming along the coast of California, they get caught in the nets. Unable to wrestle free, they slowly drown. Peak fishing season is happening now – and that doesn’t just mean catching more swordfish. It means even more non-targeted whales, sea turtles and other animals become increasingly vulnerable to capture, injury and death by drift gillnets. Oceana is fighting to get drift gillnets out of the water. With the support of Oceana members, we won numerous protections for whales and other protected species from drift gillnets off the U.S. West Coast. Just last year, the Pacific Fishery Management Council (PFMC) voted to adopt hard caps to protect nine marine mammal and sea turtle species caught as bycatch in drift gillnets, and to increase observer coverage in the fishery to 100% by 2018. While the PFMC intended those safeguards to go into effect this year, the National Marine Fisheries Service (NMFS) only just released proposed regulations to implement hard caps. The delay means rare and endangered marine animals will go without these critically important protections this fishing season – and even worse, observer coverage is at its lowest in a decade. Oceana tries to convince decision-makers to adopt and enforce policies that protect - not further endanger - animals like sea turtles, whales and dolphins. By transitioning to proven clean methods to catch swordfish, drift gillnets can become a thing of the past. 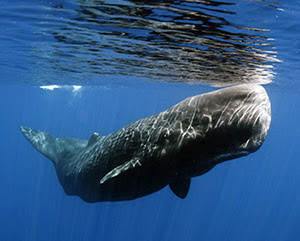 Rare, threatened and endangered species like sperm whales could be caught in mile-long walls of death this fishing season. People can become a member for US$10 and help reach the Oceana goal of 1,140 new members so Oceana has the resources to end this deadly practice. See www.oceana.org.